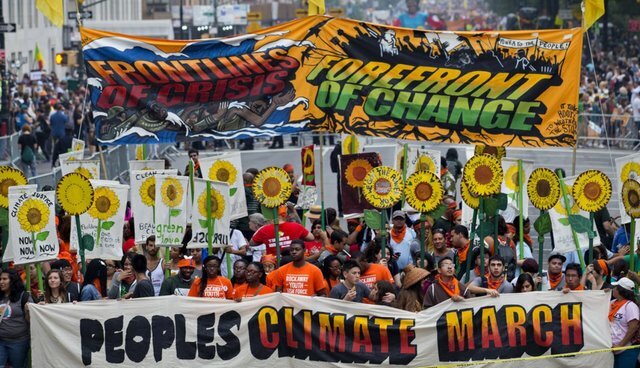 Yesterday, thousands of environmentalists are marching through the streets of New York. They do so to undertake what environmentalist Bill McKibben calls "the biggest demonstration in the history of the climate movement." The driving motivation for the first People's Climate March is a fiercely grassroots message as inspiring as it is true: "movements can shift political power. In fact, little else ever does." History demonstrates that McKibben is correct, but with one critical caveat: the movement must be focused on the right targets. It is on this point that yesterday's march, for all its passion, could lead the environmental movement down a jagged path. Modern environmentalism assumes that our ecological fall from grace began a century ago with the transition to fossil fuels. This assumption explains the movement's focus on gas pipelines and university divestment from fossil fuel multinationals. While it's certainly true that our reliance coal, oil, and gas remains endemic to our current ecological predicament, our original environmental sin is rooted in an older and more fundamental transition: the domestication of animals. You often hear environmentalists claim that there are too many people on planet Earth, about seven billion. Well, the industrialization of agriculture has culminated in a global agricultural system that annually domesticates and slaughters an astounding 70 billion land animals. Producing over 300 million tons of meat a year arguably represents the most destructive misallocation of natural resources in all human history, one that contributes disproportionately to the core issues that The People's Climate March will address: global warming, biodiversity loss, and water pollution. The most recent research on these issues pretty much ruins your steak dinner. We now know that at least 14.5 percent of human-induced greenhouse gas emissions are directly linked to the production of land-based animals. Livestock are the leading cause of methane and nitrous oxide emissions-gasses phenomenally more potent than carbon dioxide. Scientists predict that the livestock sector alone might account for 70 percent of the future greenhouse gas emissions expected to raise the earth's temperature by two degrees. If we allow business as usual to proceed, emissions from agriculture will rise another 80 percent by 2050. When it comes to biodiversity loss, domesticated critters are equally culpable. No less than 75 percent of the planet's agricultural land (30 percent of the world's ice-free surface) is used to raise animals for food. To really understand how this allocation endangers natural ecosystems, one need not look further than the Brazilian rainforest, where cattle are the direct cause of 70 percent of deforestation. When the global population hits nine billion, as it's predicted for 2050, if we all ate a western diet, 70 to 100 percent more cropland will be needed for agricultural production. Then there's the issue that's on every environmentalist's mind these days: water. From the perspective of fresh water, animal agriculture is inherently irresponsible. After all, the water footprint of any domesticated animal-based product is larger than that of any plant with the same nutritional worth. Plant-based food requires eight times less water to produce than the caloric equivalent of an animal-based food. Our ongoing failure to acknowledge this inefficiency has resulted in feed production that uses 27 percent of irrigation water in the United States. If we do nothing, the water used globally to produce animal feed will double by 2050. This would make today's water situation look like a period of abundance. Environmentalists hate this news. To the limited extent that eco-leaders have addressed these concerns, they've suggested we eat animals raised under non-industrial conditions. Free range, humane, antibiotic free, that kind of stuff. But for all the positive attention lavished on these so-called "regenerative" or "holistic" systems - systems that liberate animals from confinement and place them on pasture - there's no evidence that they would work on global scale. Animals being animals, their impact on land, water, and air quality would remain greater than that of plants. After interviewing Allan Savory, the world's leading proponent of pasture-based animal agriculture, The Guardian's George Monbiot concluded, "he makes claims about his techniques which are not only implausible but appear to be scientifically impossible." Here's something not at all implausible: transitioning to a plant-based diet would have a profoundly positive ecological impact. Eliminating domesticated animals for food would allow us to re-wild hundreds of millions of acres of land currently in production. Research shows that, in the United Kingdom, consuming just 50 percent less meat and replacing it with plant-based food would decrease greenhouse gas emissions by 19 percent. On the level of the individual, the average meat-eater would more than halve the carbon footprint of his diet by eliminating meat altogether. This option requires no leap of faith, just a dietary shift. It's the most accessible option we have. And it happens to be the best. Despite the preponderance of evidence that a plant-based diet would dramatically reduce greenhouse gas emissions, conserve substantial amounts of water, and stem habitat destruction, leading environmental organizations have proven reluctant to advocate such a transition. But if we truly care about the environment, this convenient "we don't tell people what to do" attitude must change. If the modern environmental movement neglects to recognize the connection between climate change and the billions of animals we raise each year for food-it will wake up to find it has missed the swiftest most elegant solution at hand while devouring our way into a climate crisis. Today, as we implore global leaders to take action on climate change, let us not forget that the answer to today's environmental crisis is directly in front us, right on our plates.